This holiday season Treehut watches are the most perfect personalized gifts for the women in your life! Indeed, they are more than a gift -Treehut watches are a bespoke giving experience. Treehut watches are totally customizable online with the option to engrave a personal message on each piece - allowing you to create individual, unique gifts for each person on your list. The beautiful wooden and marble collections are inspired by the idea that watches are more than just an accessory. With distinct designs for her, customize each watch making it a creation of a moment, a cherished memory, or a milestone in your life. I received this beautiful Element Black Marble Rose Gold watch. It is truly stunning. 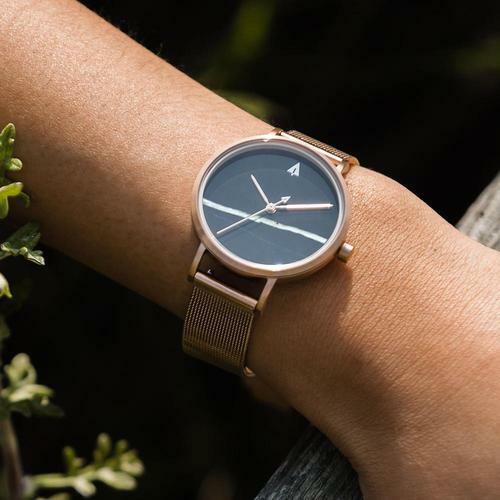 The Element Black Marble Rose Gold women's watch features a black marble dial, rose gold stainless steel case and matching metallic mesh band in rose gold. Minimalist stone dial unique to its kind. Compact and lightweight. These are nice. I like the look of the bigger watch face. (TREEHUT WATCHES) I do like the looks of this nice watch, this would be a great Christmas gift for my husband this year. I love the looks of tree hut watches!! Oooh, not normally a watch person but these are nice!!! I like the simplicity of the watch shown. I don't wear jewelry or accessories, but I do like wearing a watch when I go out . I like the simplicity of this watch .It's classy and minimal.